FORGET WHAT YOU'VE SEEN ON TV. IT'S NOT POM POMS, IT'S SO MUCH MORE! The sport of competitive cheerleading began in the USA in the 1980’s, where athletes would train their skills to stand a better chance of making their high school or college cheer team. 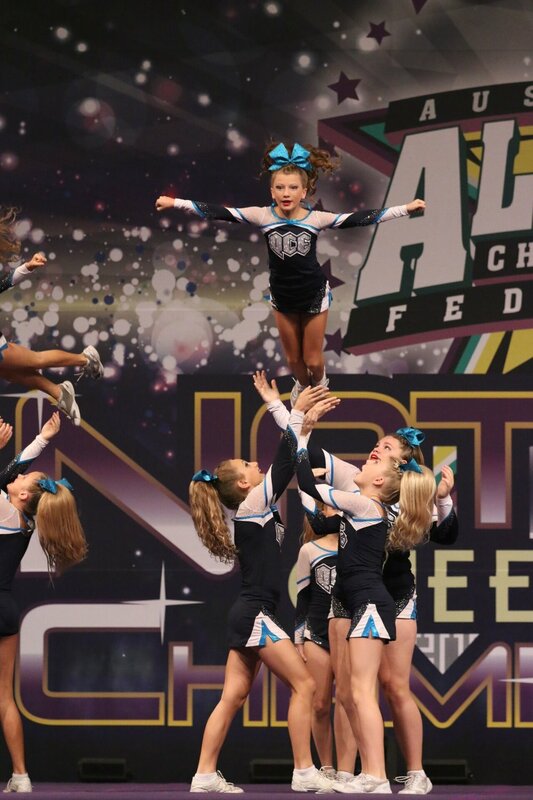 As the sport grew and grew, gaining interest internationally, more and more athletes and their families began to view competitive cheer as a sport in of itself. Fast forward 30 years, and cheerleading is one of the fastest growing sports in Australia for a reason – it’s fun, it’s fast and it gives athletes so many opportunities to develop; not just physically, but mentally and emotionally too. Given the team building nature of the sport, it’s also a fantastic family-like environment which athletes thrive in. Unlike traditional female sports, like gymnastics and dancing, cheer is a great combination of all things athletic – lifting (called stunting), jumping and tumbling (the floor skills you would see in gymnastics), mixed with all the things that girls love – music, performing, costumes and dance. These skills are combined into a 2.5 minute routine which is judged against other cheerleading teams, based on their level of difficulty, precision, creativity and entertainment value. We don't cheer on the side lines, and pom poms aren't used here - cheerleading is the sport, just like you would see at a gymnastics competition. There are hundreds of clubs around the country and they come together several times per year to compete. For our Nationals competition this year, QCE will be against 12,000 athletes across 1700 different cheerleading teams! Currently in Australia, there are over 35,000 athletes attending cheer competitions, and the number is growing every year, as more young people continue to get involved in cheerleading and everything it has to offer. Unsure what cheerleading involves at QCE? Read on! Most people are more familiar with the tumbling side of cheer, as it is heavily based in gymnastics. Tumbling refers to the flips, rolls and cartwheels you would see in a cheerleading routine, similar to the floor skills in gymnastics. Stunting is unique to cheer, and encompasses all the lifts and throws you see in our sport. There is a sense of freedom, satisfaction and togetherness about working with 3 other people to train a skill, and nothing beats the feeling of executing it successfully on the floor with your team mates cheering you on.